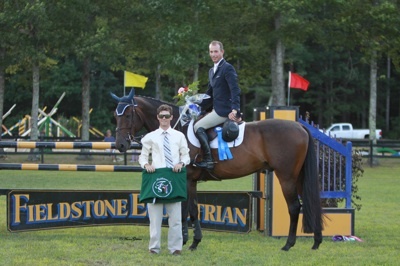 Halifax, MA - August 24, 2011 - The Fieldstone Summer Showcase hosted its first major class of the week on the Grand Prix Field with the $7,500 Open Welcome Stake. Charlie Jacobs of Boston, MA, rode Leap of Joy to first place in the class and was second on Flaming Star. 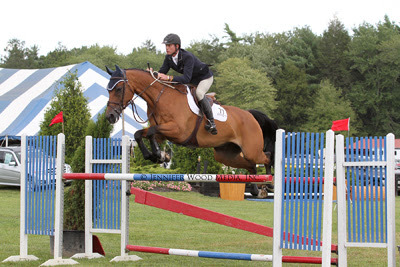 The Fieldstone Summer Showcase features top hunter/jumper competition at their beautiful facility in Halifax, MA. Today marked the second day of competition for the Fieldstone Summer Showcase, which will now run through Saturday, August 27. The MHJ Finals will run at the same times and in the same rings but now on Saturday instead of Sunday. The $25,000 Herb Chambers Companies Grand Prix start time has been moved to noon on Saturday, August 27 (from 3 p.m.). The $7,500 Herb Chambers Companies Speed Stake has been moved to Friday, August 26, at approximately 11 a.m. (from Saturday). In today's class, Jacobs rode both horses with no faults in the opening round. He returned in the jump-off first on Flaming Star and posted another clear round with a time of 43.696 seconds. Six more would follow Jacobs into the jump-off but none were able to catch his time with no faults. Jacobs bested himself when he entered the ring on his second horse, Leap of Joy. They were clear and very quick through the rollback turns over the course designed by Eric Hasbrouck. Jacobs and Leap of Joy stopped the timers in 43.556 seconds. Four more would contest the jump-off, but no other could match his feat. Third place in the class went to DJ Volandre on Tequila, owned by Gina Volandre. They were clear in 45.324 seconds. Jacobs said he enjoyed competing on the grass field, "I like this field a lot. It's very beautiful. It's really level, and the ground is very forgiving. I enjoy riding out here. It's very nice." As the Principal & Alternate Governor of the Boston Bruins hockey team, Jacobs is no stranger to competition. He has been a top rider since he was young, and he continues to excel in equestrian sport. With the Fieldstone horse shows, Jacobs feels lucky to have a top horse show "basically in my backyard." He added with a smile, "I slept in my own bed last night, drove down this morning and rode my horses. I feel very fortunate first and foremost for my string of horses but also to come here and show. My kids showed this morning and this afternoon. My niece is here. It's very much a family affair." Jacobs has owned Leap of Joy, a 10-year-old Holsteiner gelding by Lavari, for three years. He purchased the talented horse from top British show jumper Peter Charles and has brought him along through the Low Amateur-Owner Jumpers up to the open classes this summer. This past winter, they were the circuit champions in the High Amateur-Owner Jumpers at the FTI Winter Equestrian Festival (WEF). "(Leap of Joy) was a young eight so to speak; he was a little green," Jacobs described of his winning mount. "We took our time in the Amateur division and he has been great. He is leading the country for the Show Jumping Hall of Fame standings. He's had a great year. Who knows? Maybe we'll be able to do something even more interesting this winter!" Flaming Star, a 12-year-old Irish-bred gelding by Fairman, had more experience up to the 1.50m level in the United Kingdom before Jacobs purchased him last winter. "He came with more of a resume than Leap of Joy. He was more established," Jacobs said. "When I got him, I spent time during Florida trying to get to know him in the Low Amateurs, then the Mediums followed by the Highs. He was champion the last week of WEF in the High Amateurs. He did some really great things this summer. He's been really good for us." 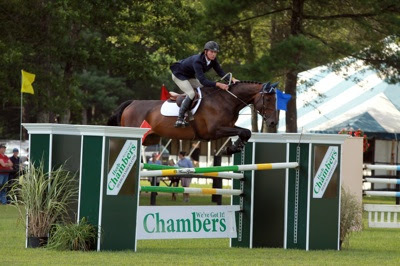 Jacobs is looking forward to showing both horses in the $25,000 Herb Chambers Companies Grand Prix on Saturday. The Fieldstone Summer Showcase continues tomorrow with a full day of competition in six rings. The highlight classes of the day are the $10,000 Pony Hunter Derby Finals and $10,000 2'9" Hunter Derby Finals on the Grand Prix Field. The stunning show grounds offer competitors, guests and spectators beautifully manicured grounds, miles of trails and an exhibitor friendly atmosphere. The facility boasts nearly 100 acres, equipped with nine all-weather show rings by GGT footing, permanent and temporary stabling, ample parking, and a beautiful all-grass Grand Prix field. Renovated in 2009, this field is a world-class venue for the facility's premier classes. With show schedules boasting over $100,000 in cash and prizes and great exhibitor parties and events, these horse shows are not to be missed!